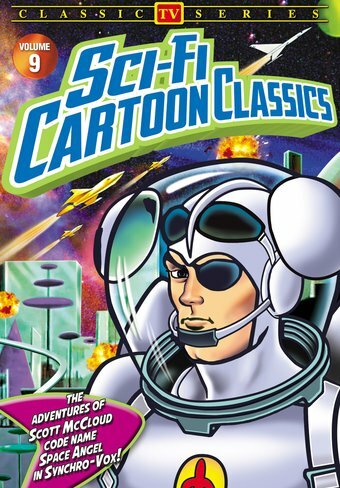 Ace astronaut Scott McCloud (codename: "Space Angel") of the Interplanetary Space Force thwarts extraterrestrial threats in four long-lost episodes of this animated TV classic. Space Angel was the second series produced by the short-lived Cambria Productions, who had previously made the Syncro-Vox animation method famous with Clutch Cargo (1959-1960). Like Clutch, the series used the cost-cutting technique of filming voice actors as they delivered dialog, and then superimposing their lips over still drawings of the characters' faces. Ned LeFevre, an old-time radio veteran who worked with Bob Hope and Red Skelton, was the voice of Scott McCloud. (His voice can also be heard as a newscaster in the classic sci-fi films Revenge of the Creature and The Deadly Mantis.) Hal Smith, best remembered as Otis on The Andy Griffith Show, voiced Taurus, the Scottish engineer, a precursor to Star Trek's Scotty. Animation and comics legends Alex Toth (Space Ghost) and Doug Wildey (Jonny Quest) created the majority of the artwork as large storyboards, to which the limited Syncro-Vox technique was then added. Space Angel used the same eerie stock music score composed by William Loose and Fred Steiner that was featured in films such as Teenagers from Outer Space, The Killer Shrews (both 1959), and, most famously, Night of the Living Dead (1968). THE ENCODER: Entire cities are being teleported to another galaxy by a mysterious interplanetary craft of unknown origin. THE PLAGUED PLANET: The Starduster lands on an irradiated planet overrun by giant mutant insects. COSMIC SEARCH: Crystal is abducted by the Anthenians, the warlike race who are sworn enemies of the Space Force. THE PLOT: Zora, the evil Queen of Outer Space, holds the Space Council for ransom in exchange for a powerful superweapon.